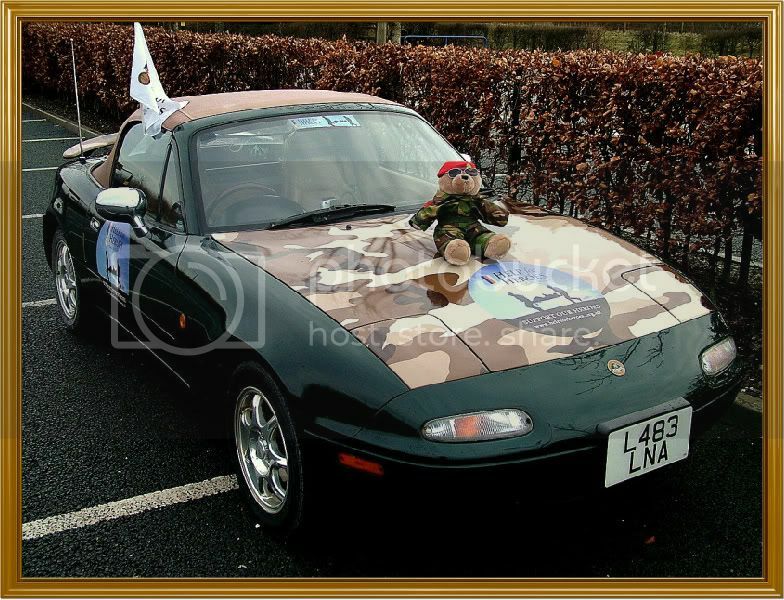 The maintenance on this Eunos has been, er.. patchy... I've never seen differential oil that colour and the magnetic plug had some interesting bits of shrapnel. Two big bits that are steel and cog - shaped and a lot of smaller filings. No worse than our Jimny front diff oil. Water has got in there. It needs flushed will talk to some experts on Monday. I'm thinking 30k miles is a better change interval. 132,000 miles and still lubbing things.....I think. The Mk1 that is...the Sport gets new all round fluids every 2 years...and new filter/oil every 6 months. OldSpice wrote: Better change mine then. drumtochty wrote: No worse than our Jimny front diff oil. I'd agree Eddie, a shade over half a litre isn't a lot. I'll be changing in 12 months to make sure all the gloop is out, only takes 30 mins to crawl underneath and change it. It's also had a new engine, brakes, exhaust, full repaint, new autotrans fluid, new radiator, hoses, lamps, springs, ball joints, tyres, window lifters, and a host of fettling bits..
Now it needs rear sills & arches, a new hood, and a leccy ariel but hey ho! Are you going to do the arches and hood on the Mk1 or is it time to move it on Robin? Not an easy decision after all these years but sometimes unless you have lots of garage space it kind of gets to the point that a newer one is needed! OK you both no longer do the miles nor do you have to get there no matter what as work is behind you but it can be nice to have a more modern car. TBH Eddie, if I move it on, it'll be for spares/scrap. It's lying in it's lock up awaiting my decision..so it's dry-stored and out the way. I've actually have the sill/wing sections in the loft, so it's a question of whim either way. Most of it's mechanical bits are fairly recent. Apart from the original suspension (and I've already got replacements courtesy of anothe forum user), all the mechanics are on the button right down to a new cambelt & water pump...on a low miles "new" engine! The Mk1 is "only" around £600/£700.00.from being top-drawer really. We have the Sport anyway which is also seperately garaged. We live literally 3/4 minutes stroll from trains & busses and have a new Tesco/Home Bargains/Lidl complex right across the bottom of the street as of late. So, cars are just an optional retirement luxury now. The Sport according to SWMBO is going nowhere anytime soon, so another car would be a petrol small capacity hatch of some sort when it eventually does go. It "owes" us 5k, which means keeping it for a return of investment for around 3 years..then maybe get 2k on a good day for it...perfect & immaculate even as it is it's just another Mk2.5. I think...I'll be leaving the Mk1 locked up for some time and fettling it up bit by bit as a hobby. The way things are, good sorted ones are fetching Mk3 money just as, a while back, I thought they would..to the derisive sniggers of some. The thought of not having the option to pack a lunch box and camera for a "glen day" hood down thrash appeals less than spending a few more hundred quid. The Sport is very good indeed and exceeds my Mk1 on a raft of levels... but it's not a Mk1 being utterly devoid of any " essence of Chapman". It's like comparing an MGTF to a 1275 Midget to me. But I'm an old fart. And...back on topic....since the above...I've decided to keep and restore. Got me thinking. Oh...starting with diff oil on order. And yes Eddie...I'll make sure the refill nut comes off OK before the drainer. OldSpice wrote: And...back on topic....since the above...I've decided to keep and restore. Got me thinking. Post up the pics of 100 000+ mile diff oil! Great looking car - I could polish my pate in that shine! Good to hear you'll keep it, looks far too good to break. I am with you 100% on the Colin Chapman thing; can't think of any car, except an Elise that can compete with a MK1 for no-frills basic driver feedback and fun. Mind you I have yet to drive an ND. On the subject of respray I am toying with the idea - silver is not my favourite colour but I reckon a good job could be, what £1K plus? Any thoughts? Next jobs are replacing the drive belts and coolant. Did the gearbox, turret oil and cam gasket, adjusted the handbrake at the w/e. I'm taking a risk on the cambelt and will replace in the winter when I strip the aircon out. Anyone used one of those cam locking tools? Last edited by CaptainNorth on Tue May 17, 2016 7:25 am, edited 1 time in total. I'll try and dig out the diff oil with a chisel if I can get one in. You won't get a good full colour change for a grand. More like 2k + for a "factory" finish. Around a grand will get you a decent enough mask-off blow ..depending on who you speak to. My full re-spray was a strip down at £1,760.00 4 years back from insurance following vandalism. Nearly wrote it off..so I put a little towards it to avoid scrappage or CAT D.
It's the old question...what's it all worth to you? Thanks OldSpice, Yep, that's too much. I could buy another car in a different colour for 2K. Ah well, I'll get used to it. Just back from my car bodywork course 6 pm to 9 pm at Aberdeen College with another Grampian member. Some of the guys were doing front and rear half wings on a 1995 Japanese tintop. Exactly like doing the rear wings on an MX5. To be honest the amount of work to get rid of rust if that is possible on the inner wheel arches etc and how long it will stay away makes me think you would be very lucky for the car not to start rusting again in say 4 or 5 years. Just my expertise after attending two, three hour classes so not that reliable. But any mx5 new or old will start rusting in 4-5 years! 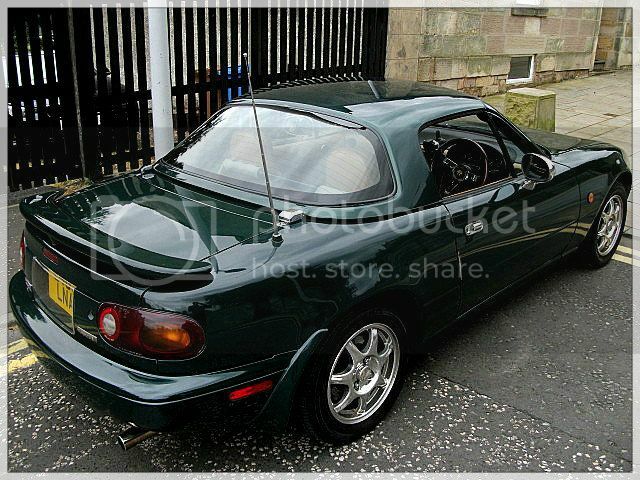 CaptainNorth wrote: But any mx5 new or old will start rusting in 4-5 years! Try two years old..from what I've personally witnessed! The instructor on the course reckoned one particular UK make will have rust in cavities within 3 months of leaving the factory if not sooner. They are made of mild steel and are consumables or if not the factories would have to shut down as we make far too many cars worldwide. drumtochty wrote: The instructor on the course reckoned one particular UK make will have rust in cavities within 3 months of leaving the factory if not sooner. ...... as we make far too many cars worldwide. Which is one reason why I recycle ours! To continue the thread derailment properly!! For metal bending I was going to make up the angle iron bender in that post of retrorides (see Rika post under General).. that with some Clarke/Machine mart dollies/hammers, a vice and some nice tin snips.. oh and a joddler.. anyway .. you can get a lot of stuff to do stuff! After that a proper 2 part epoxy undercoat (which is actually waterproof; Lechlars on top, Jotomastic under car) should keep it rust free where you can apply it for years. The issue is always the cavites and overlapping joints that have "blown" with rust. They would have you cut out the overlapping joints. With cavities I was injecting Rust buster type stuff (fancy organic phosphoric acid) with a pressure pot (which gets eaten by the acid.. so flush it well) followed by cavity wax.. and then keeping the stuff in a dehumidified garage; I think that is hundreds of years as the dehumidifier keeps rust off bare steel so should do it with rusted stuff as it starves it of the moisture that promotes the iron oxide formation. And a respray.. materials alone are best part of £300 (paint is £30-50/litre, you need 2 litres plus same again undercoat, plus a litre of lacquer if metallic, plus plastic additive plus thinners, plus plus plus..) £1k is a blow over (but I heard of a guy doing a Mundeo for £700 up in Peterhead on mates rates) and would devalue the car with a colour change - a lot cheaper to buy the colour you want really.. £2k is a fair job.. £3.5k would not be unheard of (last price I had..) and £10k could be spent if you were very very silly! The problem is Malcolm, they didn't make them in Kawasaki green and 2K is too much at the moment. It's just a Jam Jar, enjoy it and when it gets too rusty get something else.